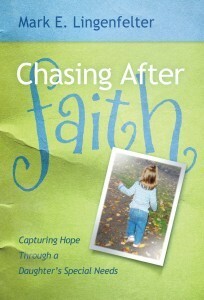 The BMH Book, Chasing After Faith, is now available in electronic format. The book, written by Pastor Mark. E. Lingenfelter of the Leamersville (Pa.) Grace Brethren Church, may be purchased at Amazon for the Kindle, Barnes and Noble for the Nook, and at iTunes in the e-book format. Cost of the electronic book is $8.99. Subtitled “Capturing Hope Though a Daughter’s Special Needs,” the book chronicles the journey Lingenfelter and his wife, Angie, took through the discovery and adjustment to a number of birth and developmental problems with their daughter, Faith. The paperback version of the book, which lists for $9.95, is also available at Amazon, Barnes and Noble, Christian Book Distributors (cbd.com), bmhbooks.com, and at bookstores in your community. A video about the book may be viewed on YouTube.